Who knows what the Missouri game will actually come down to, but Nebraska’s ability to convert on third down will certainly be key. Thus far, Nebraska is converting 45.83% of their 3rd down attempts, which ranks us 20th nationally in this statistic. On the road, however, we’ve been absolutely brutal, converting just 3/15 attempts (20%)at Wake Forest. That’s just not going to cut it in Columbia. An important component of 3rd down success is the emergence of big play guys who step up when it’s time to move the chains. If you think back to 2006, the go-to guy on 3rd down was Maurice Purify. In 2006, Nebraska threw to Purify 23 times on 3rd down resulting in 14 receptions. Of those 14 completions, 11 garnered first downs and three resulted in touchdowns. It’s early in 2007, so we’re still waiting for our 3rd down weapon to emerge…or are we? I took a closer look at Marlon Lucky’s numbers for the year and was surprised by what I saw from him, especially on 3rd down. In the table below we have Lucky’s rushing statistics on 3rd down for 2007. What jumps out immediately is the eye-popping average yards per carry. Did anyone realize that Lucky is averaging 7.77 yards per carry on third down? That’s pretty impressive. By digging a little further I was able to put that figure into perspective. In this table we have the nation’s Top 10 players in average yards per carry on third down plays (with a minimum of 10 carries). Here we see that Lucky’s 7.77 yards/carry rank 4th nationally, ahead of such stars as P.J. Hill, Ray Rice and Darren McFadden. Color me impressed. But yards per carry is really only way to look at third down backs. Another and perhaps more important variable is the running back’s ability to convert on 3rd downs. Once again I looked at the statistics and found that Lucky has turned 8 of his 13 third down carries into first downs. That’s a third down conversion percentage of 61.54%. So how does that stack up nationally? Below we see the Top 10 nationally for running backs in terms of 3rd down conversion percentage (Again minimum of 10 carries). Currently Lucky sits 9th nationally in this category. These numbers tell me that Lucky’s contributions are being overlooked by many of us (myself included). He’s proven so far that he can come up big when the offense needs yards and we haven’t even talked about his ability to catch passes out of the backfield. To help illuminate this part of his game I also examined his receptions on third down. I have to admit, I was surprised to see how infrequently we’ve thrown to Lucky on third down. However, he has had some success proving that he must be accounted for on every down, and is always a danger to move the chains for the Husker offense. Might as well take a quick look at how Nebraska is stacking up in terms of our offensive and defensive efficiency, thus far in 2007. Remember offensive efficiency is measured by way of the Scoreability Index. The Scoreability Index is obtained by dividing a team’s total yards by total points scored, yielding Yards Per Point Scored. A team that ranks high on the Scoreability Index has the offense that scores most efficiently, marching off a relatively small number of yards for every point it scores. Nebraska currently has a Scoreability Index of 13.68 which ranks 56th nationally. That means Nebraska is currently scoring one touchdown for every 82 yards of offense they generate. To put this in perspective, a year ago we scored on TD for every 81 yards of offense we generated, so we can call that a wash. When looking at how the Big 12 stacks up, you might be surprised. Nebraska has just the 8th most efficient offense in the conference. Interestingly that puts the Huskers just one spot below the high powered offense of Missouri. Things should be interesting in two weeks. Defensive efficiency is measured by way of the Bendability Index. This is the first stat that chronicles the phenomenon of the “bend-but-don’t-break” defense. The Bendability Index is obtained by dividing a team’s total yards allowed by total points allowed, yielding Yards Per Point Allowed. A team that ranks high on the Bendability Index has the defense that opponents must work hardest to score upon. You can probably guess how ugly this one is. Nebraska currently has a Bendability Index of 14.03. So far, Nebraska’s opponents have had to march just 84 yards to score the equivalent of a single touchdown. A year ago the Blackshirts forced teams to generate 108 yards of offense to score the equivalent of one TD. For those claiming this is the “worst Husker defense I have ever seen” you’d be almost right in terms of defensive efficiency. Cosgrove’s 2004 defense was actually worse. That team had a Bendability Index of 13.72 and opponents needed just 82 yards of offense to score the equivalent of one TD. This year’s totals would, however, rank as the second least efficient defense since the Osborne Era began. When looking at the Big 12, things are darn right ugly. All I can say is thank God for Iowa State. But after looking at these numbers I actually feel better about the defense and worse about the offense. While Sam Keller and the offense are racking up yards, we aren’t putting up enough points to show for all of that work. That type of inefficiency will come back to haunt us in conference play. Especially if we are going to have to outscore everyone. Defensively we are obviously bad, but most of the teams going all the way back to the Osborne era had a game or two where the defense imploded. Those games impacted the overall defensive efficiency of the team, but didn’t necessarily result in losses. At the very worst, if the defensive numbers continue at this rate we should finish somewhere between the 2002 team and the 2004 team. In other words, we could expect about six wins. Ouch. Today we’ll look briefly at the historical data concerning Nebraska’s Scoreability Index over time. You can see the entire spreadsheet here. Have fun. Here are the Top 10 seasons since the Osborne era began in terms of offensive efficiency. Interestingly only one of our National Championship teams makes the list. This is due in part (I think), to the ways in which certain Nebraska teams dominated their competition. If we consider the 1995 team, which blew out pretty much everyone, you get to a point where that team was just racking up yards with its scrubs, but then taking knee and refusing to put up points. That would certainly hurt its efficiency as calculated by this method. That’s at least my best guess to explain this. Now we have the worst ten seasons since the Osborne era began in terms of offensive efficiency. First thing that jumps out at me is that we see both 1973 and 2004 on the list. What do these two seasons have in common? Breaking in a new head coach. We also see that the last two seasons of the Solich era also make this list. This should surprise absolutely no one who was actually paying attention. Is anybody surprised to see that 2006 made the Top 10 in least efficient offensive performances? In some ways it is unexpected but our performances against teams like KSU, and ISU involved pretty big chunks of yardage and not a lot of point production. That adds up pretty quickly when we use this methodology. In the first part of this series I introduced to the concept of the Scoreability Index. I explained the value of this statistic as a measure of offensive efficiency and attempted to prove that it was worthwhile to track in college football. In Part II, I will take a closer look at the national rankings in this statistic, with particular attention paid to Nebraska’s offensive efficiency. First, you can check out the entire Scoreability Index spreadsheet here. This should give you access to how this statistic is calculated and what the rankings look like for all 119 Division I-A teams. Right away, you will notice a few surprises, including Pittsburgh, SMU(?) and Nevada. However, all of the teams in the Top 10 had a .500 record or better and combined for an overall record of 94-34 (.734). Overall, Boise State had the most efficient offense in 2006. The undefeated Broncos scored one touchdown for every 64 yards of offense they generated. You can watch their proficient offense at work in these Fiesta Bowl highlights. The least efficient offense in 2006 belonged to the Golden Panthers of Florida International. FIU managed just one touchdown for every 146 yards of offense they generated. That’s exactly how you go 0-12. No wonder they was always fightin’. Now let’s turn our attention to the Huskers. Nebraska finished a modest 43rd nationally in the Scoreability Index, obviously meaning they were the 43rd most efficient offensive unit in 2006. The Huskers produced 428 points, and 5804 yards. This produced a Scoreability Index of 13.56. Thus, the Huskers scored one touchdown for every 81 yards of offense they generated. If we look at this statistic on a game-by-game basis (this is a less exact science), we can see our offensive efficiency in each match-up. Let’s start with our least efficient offensive performance. I managed to guess this one, and I have a feeling you might have as well. That cold night in KC for the Big 12 Championship, turned out to be our least efficient offensive performance and by quite a margin. In that game, the Huskers generated just 7 points off of 366 yards. That equates to a Scoreability Index of 52.29. In other words, Nebraska needed to produce 314 yards for the equivalent of one TD (six points) against the Sooners. Our other inefficient offensive performances came against USC (21.10), Texas (17.00), KSU (16.95), and Auburn (16.43). Nebraska’s top three offensive efficiency performances came against non-conference opponents Nicholls St. (8.89), Troy (10.66), and Louisiana Tech (11.92). The Huskers’ most efficient offensive effort in conference play came against Missouri (12.32). The only odd finding overall related to the Scoreability Index came in the Kansas State game. That was the Huskers least-efficient offensive performance in which they managed a win. If we think back to the findings for the Bendability Index, we will notice that the KSU game just happened to be our most efficient defensive performance of the year. See how these statistical measures interplay? We can put the performance of Nebraska in perspective by examining how the Big 12 shakes out in terms of the Scoreability Index in 2006. There are a few surprises here, but first things first. When discussing the Bendability Index, I noted that while Nebraska had a more efficient defense in 2006, the Sooners still won the head-to-head matchup. Now we know a little more about why. Overall, the Sooners offense (even with a WR at QB) was more efficient than that of the Huskers. In addition, see above for an explanation of just how awful our offense was in the Big 12 Championship Game. Another surprise is Baylor listed ahead of us. That stings obviously, but don’t be too quick to discredit the Scoreability Index as a viable measure. If we look at the teams ahead of us (and that we played in 2006) on this list, you’ll notice that we lost to all but one of them. The one game we won against a team with a better Scoreability Index was Kansas, and we needed OT to sneak by the Jayhawks at home. That trend actually applies to our entire 2006 schedule, as every team Nebraska lost to in 2006 had a more efficient offense than the Huskers. Still think this Scoreability Index doesn’t matter? In Part III of this series I will again take a look at Nebraska’s historical performance as it relates to the Scoreability Index. Earlier I introduced to the Bendability Index, a measure of defensive efficiency and one of the “Stats That Matter” at Cold, Hard Football Facts. Today I want to switch sides of the ball and look at offensive efficiency. Cold, Hard Football Facts has a stat for that as well. This is measure is known as the Scorability Index. Scoreability Index – This is the offensive counterpart of the Bendability Index. The Scoreability Index is obtained by dividing a team’s total yards by total points scored, yielding Yards Per Point Scored. A team that ranks high on the Scoreability Index has the offense that scores most efficiently, marching off a relatively small number of yards for every point it scores. This effort is more important than total offense and, in many cases, more important than scoring offense. The Scoreability Index is not purely an offensive yardstick. It is, instead, a great barometer of team success. It is a function of many team-wide factors, including general offensive strength, defense and special teams proficiency, turnover differential and Red Zone offense. Pity poor Oakland. The Raiders will not only go down as one of the most inept offenses in modern NFL history, scoring just 10.5 PPG and averaging a dreadful 4.4 yards everytime they dropped back to pass, they also wasted a lot of effort this season moving the ball up and down the field for no reason. Oakland needed to generate 23.45 yards to score a single point this season. That’s more than twice the effort expended by division rival San Diego, which needed just 11.87 yards to score a single point. To put it in more concrete football terms, the Chargers scored one touchdown for every 71 yards of offense they generated. The Raiders scored one touchdown for every 140 yards of offense they generated. As a result, one team has the best record in football. The other team has the worst record in football. That’s a pretty telling statistic in the NFL, but what about in college football? To find out, I again constructed a spreadsheet ranking NCAA teams in terms of the Scoreability Index for 2006. Next I used SMQ’s methodology for determining the relevance of a particular statistic in CFB. This meant finding the winning percentage of the Top 20 teams in the Scoreability Index category, as well as the winning percentage of the Bottom 20 teams in the Scoreability Index. Calculating the disparity margin of the Scoreability Index produced a figure of +.485. This means that the Scoreability Index produces the most relevant offensive statistic in terms of winning percentage. The Scoreability Index is obtained by dividing a team’s total yards by total points scored, yielding Yards Per Point Scored. A team that ranks high on the Scoreability Index has the offense that scores most efficiently, marching off a relatively small number of yards for every point it scores. This is another interesting statistic and I believe it makes sense to think about teams in terms of how hard they are working to put points up on the board. We also have some evidence that this statistic is relevant in CFB. In fact, it looks to be more important than some of the statistics folks around Nebraska continue to harp on way too much – most notably, Time of Possession and Rushing Offense. These two statistics just didn’t matter in college football in 2006. But the Scoreability Index did. In Part II of this series I will look at how the teams ranked nationally in terms of the Scoreability Index. I will also examine where Nebraska fits in with regard to this statistic. In the first part of this series I introduced to the concept of the Bendability Index. I explained the value of this statistic as a measure of defensive efficiency and attempted to prove that it was worthwhile to track in college football. In Part II, I will take a closer look at the national rankings in this statistic, with particular attention paid to Nebraska’s performance on this variable. First, you can check out the entire Bendability Index spreadsheet here. This should give you access to how this statistic is calculated and what the rankings look like for all 119 Division I-A teams. Teams in the Top 10 in this statistic had a combined record of 109-22 (.832). They won five conference championships and played in four BCS bowls. In their bowl games these teams then went 7-3 (Louisville and Wake played each other). Clearly this statistic has some clout. Overall, Ohio State had the most efficient defense in 2006. The Buckeyes forced opponents to march 132 yards to score the equivalent of a single touchdown. The least efficient defense in 2006 belonged to Turner Gill’s Buffalo squad. Opponents needed to gain just 65 yards to score the equivalent of a single touchdown on the Bulls. Is it any wonder the team went 2-10 last season? Now let’s turn our attention to the Blackshirts. Nebraska finished a respectable 15th nationally in the Bendability index, obviously meaning they were the 15th most efficient defensive unit in 2006. The Huskers surrendered 256 points (2nd highest total in the Top 20), and 4646 yards. This produced a Bendability Index of 18.15. Thus, the Blackshirts forced opponents to march 109 yards to score the equivalent of a single TD last season. If we look at this statistic on a game-by-game basis (this is a less exact science), we can see our defensive efficiency in each match-up. Let’s start with our least efficient defensive performance. Any guesses? My first thought was Oklahoma State and our implosion in Stillwater. Close, that was our second least efficient game. The least efficient defensive performance actually came in the Cotton Bowl against Auburn. The War Tigers managed 17 points on just 178 yards. That equates to a Bendability Index for the game of 10.47. In other words Auburn needed to drive just 63 yards for the equivalent of a single touchdown in the Cotton Bowl. Clearly the outcome was also decided by Nebraska’s offensive inefficiency and the dreaded fake punt call. As I said other inefficient defensive performances came against OSU (BI = 12.1), USC (14.3), OU (14.62), and Texas (15.82). All losses. Nebraska’s most efficient performance came against Kansas State. Rojo actually made mention of this on HuskerPedia. The Wildcats put up 294 yards, but managed just 3 points. That works out to an incredible Bendability Index of 98.00! Again, if we extrapolate from that figure we find that it would have taken KSU driving 588 yards to put up the equivalent of one TD. Quick note – the Troy game had to be taken out, as the shut out made calculating the Bendability Index unpossible (stupid zeros and division). Most of our other efficient defensive performances came against non-conference opponents. In the Big 12, the defensive was particularly proficient against ISU and Colorado. The rest of the Big games involved performances that were less efficient than the season average (BI < 18.15). We can put the performance of the Blackshirts in perspective by examining how the Big 12 shakes out in terms of the Bendability Index in 2006. Not surprisingly the two teams that met in the conference championship game fill the top two spots in the conference in Bendability Index. The order might be somewhat surprising to some, given the salty reputation of OU’s defense and their success in the head-to-head match-up. If I had to guess the reason for this discrepancy, I would say that Oklahoma enjoyed a more efficient offense in 2006 than did Nebraska. Again this might surprise you, but stay tuned and I’ll address this is in a later post. The next level of teams includes three more you would expect in Missouri, Texas, and Texas A&M. Texas had problems in the defensive backfield, which accounted for a lot of yards, but their ranking is about what I expected. Missouri, despite the attacks on Pinkel, actually put up defensive numbers that were quite comparable to Nebraska’s a year ago. The team with the better defense between these two schools in 2007 will likely win the North (really going out on a limb there!). The biggest surprise is 2-10 Colorado at 6th in Big 12. But don’t forget that the Buffs’ defense was pretty stingy in our match-up a year ago. We relied on some key trick plays to account for both yards and points. Their offense, however, was absolutely horrible and was one of the least efficient in the nation. Oklahoma State and Texas Tech were two other teams that relied more on high-powered offenses which allowed for less efficient defensive play. Iowa State and Baylor round out the conference. They are, well, Iowa State and Baylor. Ok, I think I’m starting to ramble a bit. Can you tell my summer teaching duties are over? Very nice. Part III of this series will put Nebraska’s defensive efficiency into historical context. How much history is yet to be decided. I don’t like to give people data that allows them to compare across the various coaching staffs. So I might just focus on the three years of the Callahan regime. We’ll see. As you can probably tell, I am fascinated by the world of sports statistics. I spend many evenings banging out spreadsheets filled with stats and variables related to Nebraska football and college football as a whole. I am constantly searching for some way of quantifying success/improvement or of determining which statistics matter and which don’t. Recently I’ve been thinking more about the defensive side of the ball. On Monday I noticed that the poster Rojo had started a thread at both HuskerPedia and the Red Sea Scrolls about Nebraska’s Pass Defense. As always, Rojo presented some great information. This post actually led to very little meaningful discussion on HuskerPedia, although I was surprised it didn’t quickly become a Pelini – Sanders – McBride- Cosgrove – Elmassian debate. Side note – HuskerPedia currently has a poll question asking who fans would rather have as their DB coach and over 70% support Marvin Sanders. That’s a lot of support for a guy who is currently out of work. But I digress. Let’s be clear: The most important thing for a defense is keeping the other guys out of the end zone. Bendability Index – This is the first stat that chronicles the phenomenon of the “bend-but-don’t-break” defense and provides a measure of defensive efficiency. The Bendability Index is obtained by dividing a team’s total yards allowed by total points allowed, yielding Yards Per Point Allowed. A team that ranks high on the Bendability Index has the defense that opponents must work hardest to score upon. This effort is more important than total defense and, in many cases, more important than scoring defense. The Bendability Index is not purely a defensive yardstick. It is, instead, a great barometer of team success. It is a function of many team-wide factors, including general defensive strength, offense and special teams proficiency, turnover differential and Red Zone defense. This is exactly what I was looking for, a measure of defensive efficiency. In their discussion Cold, Hard Football Facts notes that this statistic is quite telling in the NFL. The top seven defenses made the playoffs. 9 playoff teams ranked in the Top 10 (and 10 in the Top 11). The playoff teams ranked from No. 1 to No. 17 – the narrowest spread. But before I got too excited, I needed to determine if the statistic carried as much weight in college football. To do this I first constructed a spreadsheet ranking NCAA teams in terms of the Bendability Index for 2006. Next I used SMQ’s methodology for determining the relevance of a particular statistic in CFB. This meant finding the winning percentage of the Top 20 teams in the Bendability Index category, as well as the winning percentage of the Bottom 20 teams in the Bendability Index. *SMQ did not actually calculate the relevance of scoring defense. I was able to throw it together and come up with this figure. When I calculated the disparity margin for the Bendability Index, I was surprised to discover it was + .522. In other words, Bendability Index actually appears to be a more relevant defensive statistic in terms of winning percentage than all but scoring defense. I like this statistic and think we have some proof that it matters in CFB. In addition, it seems to add to the statistic of scoring defense by accounting for overall defensive efficiency or the number of yards necessary for a team to put up points on a defense. In Part II of this series I will look at how the teams ranked nationally in terms of the Bendability Index. I will also examine where Nebraska fits in with regard to this statistic. In my continuing quest to continue to help bring college football into the Moneyball era I’ve run across another interesting football statistic. This one comes to you from the fine work of Statistically Speaking. This variable is the Standard Deviation Power Index. This index originates from Eddie Epstein’s book Dominance. It focuses solely on conference play and looks at a team’s points scored and allowed relative to the league average and standard deviation. The mean points scored and allowed for all ACC teams in conference play (championship game not included) was 162 points. The standard deviation for points scored was 35.97. The standard deviation for points allowed was 51.18. Coastal Division champ Georgia Tech scored 213 and allowed 155 points. Georgia Tech’s offensive SDPI was 1.42 = ([213-162]/35.97). Their defensive SDPI was .14 = ([162-155]/51.18). Their total SDPI was 1.55 (not 1.56 because the other two were rounded). In the 2006 ACC, that was good for third best. As part of his SDPI project, Statistically Speaking broke down the conferences in a historical manner. He examined the Big 12 from 1998-2006. 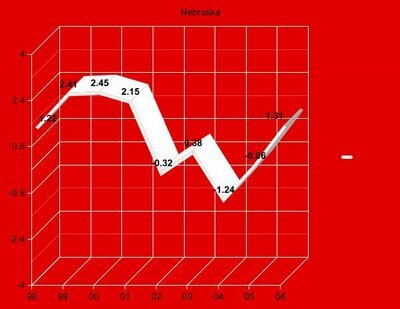 This is what Nebraska’s SDPI looks like in graphical form for those particular years. This is what he had to say about Nebraska’s historical SDPI in the Big 12. You’ll first want to keep in mind, the SDPI does not adjust for schedule strength for conferences such as the Big 12 where each team does not play each other and it ignores special teams which can play a significant role in both points scored and points allowed. However, this seems again like an interesting statistic that appears to correlate with performance at least to some degree. I just wanted to introduce it to you today. I plan on getting into at a deeper level in the future. You are currently browsing the archives for the Stat Geekery category.